Best friends do everything together…right? “Mr. Fluffernutter and I are best friends. 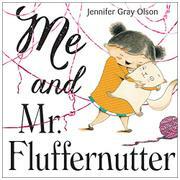 // We love spending time together / doing all of our favorite things.” A light-skinned girl with two puffy, pompom ponytails and her Siamese cat, Mr. Fluffernutter, draw pictures (he bats at the crayons) and chase butterflies. The tea party that follows seems less to Mr. Fluffernutter’s liking (perhaps it’s the hat). He doesn’t look to be enjoying swinging or swimming either. His little girl just doesn’t understand why he would walk away from playing baby in the pram (he’s wearing a bonnet, of course). Seems he’d rather watch the goldfish swim (which she finds boring). His stinky choice of lunch and insistence on lengthy bouts of yarn play make the girl question their friendship. Maybe they’ll have fun alone—but they don’t, a fact made plain in both expression and body language in a double-page spread of vignettes. They find they really do enjoy doing everything together—but sometimes they “just do it a little differently.” Olson applies the same sweetly dry humor to feline-human relations that she did to ninja bunnies. Her pudgy, watercolor-and-pencil illustrations smartly convey the depth of the bond between these two. Young listeners might not catch Mr. Fluffernutter’s discontent at first glance, but his expressions tell all for the observant tot.